This article is about the American writer. For the physicist who is president of Rensselaer Polytechnic Institute, see Shirley Ann Jackson. A native of San Francisco, California, Jackson later attended Syracuse University in New York, where she became involved with the university's literary magazine and met her future husband Stanley Edgar Hyman. The couple settled in North Bennington, Vermont in 1940, after which Hyman established a career as a literary critic, and Jackson began writing. A reclusive woman, Jackson remained in North Bennington for the last years of her life, and was reluctant to discuss her work with the public. By the 1960s, her health began to deteriorate significantly as a result of her increasing weight and cigarette smoking, ultimately leading to her death due to a heart condition in 1965 at the age of 48. Jackson has been cited as an influence on a diverse set of authors, including Neil Gaiman, Stephen King, Sarah Waters, Nigel Kneale, Joanne Harris, and Richard Matheson. Jackson was born December 14, 1916 in San Francisco, California to Leslie and Geraldine Jackson. [b] She was of English ancestry, and her mother Geraldine traced her family heritage to the Revolutionary War hero General Nathanael Greene. Jackson's maternal grandfather, John Stephenson, had been a prominent lawyer in San Francisco—later a Superior Court Judge in Alaska— while her great-great grandfather was Samuel Charles Bugbee, an architect , whose works included the homes of Leland Stanford and Charles Crocker and the Mendocino Presbyterian Church. "My grandfather was an architect, and his father, and his father"
Jackson was raised in Burlingame, California, an affluent middle-class suburb of San Francisco, where her family resided in a two-story brick home located at 1609 Forest View Road. Her relationship with her mother was strained, as her parents had married young and Geraldine had been disappointed when she immediately became pregnant with Shirley, as she had been looking forward to "spending time with her dashing husband". Jackson was often unable to fit in with other children and spent much of her time writing, much to her mother's distress. When she was a teenager, her weight fluctuated, resulting in a lack of confidence that she would struggle with throughout her life. She attended Burlingame High School, where she played violin in the school orchestra. During her senior year of high school, the Jackson family relocated to Rochester, New York, after which she attended Brighton High School, receiving her diploma in 1934. She then attended the nearby University of Rochester, where her parents felt they could maintain supervision over her studies. Jackson was unhappy in her classes there, and took a year-long hiatus from her studies before transferring to Syracuse University, where she flourished both creatively and socially. Here she received her bachelor's degree in journalism. While a student at Syracuse, Jackson became involved with the campus literary magazine, through which she met her future husband, Stanley Edgar Hyman, who later became a noted literary critic. While attending Syracuse, the university's literary magazine published Jackson's first story, "Janice", about a teenager's suicide attempt. After graduating, Jackson and Hyman married in 1940, and had brief sojourns in New York City and Westport, Connecticut, ultimately settling in North Bennington, Vermont, where Hyman had been hired as an instructor at Bennington College. Jackson began writing material as Hyman established himself as a critic. Jackson and Hyman were known for being colorful, generous hosts, who surrounded themselves with literary talents, including Ralph Ellison. They were both enthusiastic readers whose personal library was estimated at over 100,000 books. They had four children, Laurence (Laurie), Joanne (Jannie), Sarah (Sally), and Barry, who later achieved their own brand of literary fame as fictionalized versions of themselves in their mother's short stories. According to Jackson's biographers, her marriage was plagued by Hyman's infidelities, notably with his students, and she reluctantly agreed to his proposition of maintaining an open relationship. Hyman also controlled their finances (meting out portions of her earnings to her as he saw fit), despite the fact that after the success of "The Lottery" and later work she earned far more than he did. In 1954, Jackson published The Bird's Nest (1954), which detailed a woman with multiple personalities and her relationship with her psychiatrist. One of Jackson's publishers, Roger Strauss, deemed The Bird's Nest "a perfect novel", but the publishing house marketed it as a psychological horror story, which displeased her. Her following novel, The Sundial, was published four years later and concerned a family of wealthy eccentrics who believe they have been chosen to survive the end of the world. She later published two memoirs, Life Among the Savages and Raising Demons. Jackson's fifth novel, The Haunting of Hill House (1959), follows a group of individuals participating in a paranormal study at a reportedly haunted mansion. The novel, which interpolated supernatural phenomena with psychology, went on to become a critically esteemed example of the haunted house story, and was described by Stephen King as one of the most important horror novels of the twentieth century. Also in 1959, Jackson published the one-act children's musical The Bad Children, based on Hansel and Gretel. By the time The Haunting of Hill House had been published, Jackson suffered numerous health problems. She was overweight, as well as a heavy smoker, which resulted in chronic asthma, joint pain, exhaustion, and dizziness leading to fainting spells, which were attributed to a heart problem. Near the end of her life, Jackson also saw a psychiatrist for severe anxiety, which had kept her housebound for extended periods of time. To ease her anxiety and agoraphobia, the doctor prescribed barbiturates, which at that time were considered a safe, harmless drug. For many years, she also had periodic prescriptions for amphetamines for weight loss, which may have inadvertently aggravated her anxiety, leading to a cycle of prescription drug abuse using the two medications to counteract each other's effects. Any of these factors, or a combination of all of them, may have contributed to her declining health. Jackson confided to friends that she felt patronized in her role as a "faculty wife", and ostracized by the townspeople of North Bennington. Her dislike of this situation led to her increasing abuse of alcohol in addition to tranquilizers and amphetamines. Despite her ailing health, Jackson continued to write and publish several works in the 1960s, including her final novel, We Have Always Lived in the Castle (1962), a Gothic mystery novel. The novel was named by Time magazine as one of the "Ten Best Novels" of 1962. The following year, she published Nine Magic Wishes, an illustrated children's novel about a child who encounters a magician who grants him numerous enchanting wishes. In 1965, Jackson died in her sleep, at her home in North Bennington, at the age of 48. Her death was attributed to a coronary occlusion due to arteriosclerosis  or cardiac arrest . She was cremated, as was her wish. In 1968, Jackson's husband released a posthumous volume of her work, Come Along with Me, containing her unfinished last novel, as well as 14 previously uncollected short stories (among them "Louisa, Please Come Home") and three lectures she gave at colleges or writers' conferences in her last years. In 1996, a crate of unpublished stories was found in a barn behind Jackson's house. A selection of those stories, along with previously uncollected stories from various magazines, were published in the 1996 collection Just an Ordinary Day. The title was taken from one of her stories for The Magazine of Fantasy & Science Fiction, "One Ordinary Day, with Peanuts". Jackson's papers are available in the Library of Congress. In its August 5, 2013, issue The New Yorker published "Paranoia", which the magazine said was discovered at the library. Let Me Tell You, a collection of stories and essays by Jackson (mostly unpublished) was released in 2015. In addition to radio, television, and theater adaptations, "The Lottery" has been filmed three times, most notably in 1969 as an acclaimed short film that director Larry Yust made for an Encyclopædia Britannica educational film series. The Academic Film Archive cited Yust's short "as one of the two bestselling educational films ever". Eleanor Parker starred in Hugo Haas' Lizzie (1957), based on The Bird's Nest, with a cast that included Richard Boone, Joan Blondell, and Marion Ross. In 1963, screenwriter Nelson Gidding adapted The Haunting of Hill House into the screenplay for the film The Haunting, with Julie Harris and Claire Bloom, directed by Robert Wise. Jackson's 1962 novel, We Have Always Lived in the Castle, was adapted for the stage by Hugh Wheeler in the mid-1960s. Directed by Garson Kanin, starring Shirley Knight, it opened on Broadway on October 19, 1966. The David Merrick production closed after only nine performances at the Ethel Barrymore Theatre, but Wheeler's play continues to be staged by regional theater companies. Joanne Woodward directed Come Along with Me (1982), adapted from Jackson's unfinished novel as an episode of American Playhouse, with a cast headed by Estelle Parsons and Sylvia Sidney. In 1999, The Haunting of Hill House was adapted into the critically panned The Haunting, directed by Jan de Bont and starred Liam Neeson and Catherine Zeta-Jones. In 2010, We Have Always Lived in the Castle was adapted into a musical drama by Adam Bock and Todd Almond and premiered at Yale Repertory Theatre on September 17, 2010; the production was directed by Anne Kauffman. A major motion picture adaptation of We Have Always Lived in the Castle began production in 2016, with a release date originally set for summer of 2017, but premiered in September 2018. It stars Alexandra Daddario, Crispin Glover, Sebastian Stan, and Taissa Farmiga. The executive producer is Michael Douglas, with Jackson's son and literary executor, Laurence Jackson Hyman, as co-executive producer. Hyman was disappointed by earlier screen versions of his mother's work, and decided to take a more active role in such. In 2018, Kennedy/Marshall began development through Paramount Pictures of a feature-length film based on Jackson's short story, "The Lottery". The screenplay will be written by Jake Wade Wall. 1944 – Best American Short Stories 1944: "Come Dance with Me in Ireland"
1949 – O. Henry Prize Stories 1949: "The Lottery"
1951 – Best American Short Stories 1951: "The Summer People"
1956 – Best American Short Stories 1956: "One Ordinary Day, with Peanuts"
1961 – Mystery Writers of America Edgar Allan Poe Award for Best Short Story: "Louisa, Please Come Home"
1964 – Best American Short Stories 1964: "Birthday Party"
1966 – Mystery Writers of America Edgar Allan Poe Award for Best Short Story: "The Possibility of Evil"
In 2007, the Shirley Jackson Awards were established with permission of Jackson's estate. They are in recognition of her legacy in writing, and are awarded for outstanding achievement in the literature of psychological suspense, horror, and the dark fantastic. The awards are presented at Readercon. Since at least 2015, Jackson's adopted home of North Bennington has honored her legacy by celebrating Shirley Jackson Day on June 27, the day the fictional story "The Lottery" took place. Lenemaja Friedman's Shirley Jackson (Twayne Publishers, 1975) was the first published survey of Jackson's life and work. Judy Oppenheimer also covers Shirley Jackson's life and career in Private Demons: The Life of Shirley Jackson (Putnam, 1988). S. T. Joshi's The Modern Weird Tale (2001) offers a critical essay on Jackson's work. A comprehensive overview of Jackson's short fiction is Joan Wylie Hall's Shirley Jackson: A Study of the Short Fiction (Twayne Publishers, 1993). 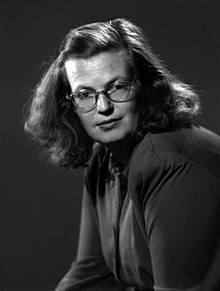 The only critical bibliography of Jackson's work is Paul N. Reinsch's A Critical Bibliography of Shirley Jackson, American Writer (1919–1965): Reviews, Criticism, Adaptations (Edwin Mellen Press, 2001). Darryl Hattenhauer also provides a comprehensive survey of all of Jackson's fiction in Shirley Jackson's American Gothic (State University of New York Press, 2003). Bernice Murphy's recent Shirley Jackson: Essays on the Literary Legacy (McFarland, 2005) is a collection of commentaries on Jackson's work. Colin Hains's Frightened by a Word: Shirley Jackson & Lesbian Gothic (2007) explores the lesbian themes in Jackson's major novels. According to the post-feminist critic Elaine Showalter, Jackson's work is the single most important mid-twentieth-century body of literary output yet to have its value reevaluated by critics. In a March 4, 2009, podcast distributed by the business publisher The Economist, Showalter also noted that Joyce Carol Oates had edited a collection of Jackson's work called Shirley Jackson Novels and Stories that was published in the  Library of America series. Jackson's husband wrote in his preface to a posthumous anthology of her work that "she consistently refused to be interviewed, to explain or promote her work in any fashion, or to take public stands and be the pundit of the Sunday supplements. She believed that her books would speak for her clearly enough over the years". Hyman insisted that the dark visions found in Jackson's work were not, as some critics claimed, the product of "personal, even neurotic, fantasies", but, rather, comprised "a sensitive and faithful anatomy" of the Cold War era in which she lived, "fitting symbols for [a] distressing world of the concentration camp and the Bomb". Jackson may even have taken pleasure in the subversive impact of her work, as indicated by Hyman's statement that she "was always proud that the Union of South Africa banned 'The Lottery', and she felt that they at least understood the story". The 1980s witnessed considerable scholarly interest in Jackson's work. Peter Kosenko, a Marxist critic, advanced an economic interpretation of "The Lottery" that focused on "the inequitable stratification of the social order". Sue Veregge Lape argued in her Ph.D. thesis that feminist critics who did not consider Jackson to be a feminist played a significant role in her lack of earlier critical attention. In contrast, Jacob Appel has written that Jackson was an "anti-regionalist writer" whose criticism of New England proved unpalatable to the American literary establishment. In 2009, critic Harold Bloom published an extensive study of Jackson's work, challenging the notion that it was worthy of inclusion in the Western canon; Bloom wrote of "The Lottery", specifically: "Her art of narration [stays] on the surface, and could not depict individual identities. Even 'The Lottery' wounds you once, and once only." Paranoia 2013 "Paranoia". The New Yorker. 89 (23): 62–66. August 5, 2013. ^ The Haunting of Hill House has been ranked as the 8th "Scariest Novel of All Time" by horrornovelreviews.com, and in Paste magazine's unsorted "30 Best Horror Books of All Time", Tyler R. Kane said, "If you go by the consensus of the literary community, Haunting of Hill House isn’t only a book that revolutionized the modern ghost story—it’s also the best." ^ Jackson would later claim to have been born in 1919 to appear younger than her husband, though she was in fact born in 1916. ^ Harris, Joanne (December 14, 2016). "Shirley Jackson centenary: a quiet, hidden rage". The Guardian. London. Retrieved December 22, 2016. ^ "Shirley H Jackson, Born 12/14/1916 in California". CaliforniaBirthIndex.org. Retrieved 16 October 2018. ^ "Shirley Jackson's Bio". shirleyjackson.org. Retrieved 2018-10-12. ^ Franklin 2016, p. 12. ^ Joshi, S. T. (2001). The Modern Weird Tale. McFarland. ISBN 978-0-786-40986-0. ^ Franklin 2016, pp. 22–3. ^ Oppenheimer 1988, p. 11. ^ Franklin 2016, pp. 13–14. ^ The San Francisco Public Library also holds a document entitled Information about Samuel Charles Bugbee, written by a relative, Arthur S. Bugbee, in 1957. ^ a b Bradfield, Scott (September 30, 2016). "Shirley Jackson and her bewitching biography, 'A Rather Haunted Life'". Los Angeles Times. Retrieved February 6, 2018. ^ "PCAD - Samuel Charles Bugbee". pcad.lib.washington.edu. Retrieved 16 October 2018. ^ "Bugbee, Samuel Charles - Biographical Dictionary of Architects in Canada". dictionaryofarchitectsincanada.org. Retrieved 16 October 2018. ^ "Guide to the Samuel Charles Bugbee Papers". oac.cdlib.org. Retrieved 16 October 2018. ^ Franklin, Ruth (27 September 2016). "Shirley Jackson: A Rather Haunted Life". Liveright Publishing. Retrieved 16 October 2018 – via Google Books. ^ Franklin 2016, p. 28. ^ Oppenheimer 1988, p. 13. ^ Franklin 2016, p. 14. ^ a b Franklin 2016, p. 24. ^ Oppenheimer 1988, p. 37. ^ Oppenheimer 1988, p. 56. ^ Oppenheimer, Judy (1988). Private demons: The life of Shirley Jackson. Putnam. p. 61. ISBN 978-0-399-13356-5. ^ Franklin 2016, p. 65. ^ Franklin 2016, p. 58. ^ "In Search of Shirley Jackson's House". lithub.com. 28 September 2016. Retrieved 16 October 2018. ^ Franklin 2016, p. 159. ^ Franklin 2016, p. 194. ^ Franklin 2016, p. 155. ^ Franklin 2016, pp. 352, 357. ^ Franklin 2016, p. 333. ^ Franklin 2016, p. 336. ^ Franklin 2016, p. 351. ^ Susan Scarf Merrell (August 10, 2010). "Shirley Jackson Doesn't Have a House". writershouses.com. Retrieved 16 October 2018. ^ Franklin 2016, p. 312. ^ "Shirley Jackson". Contemporary Authors Online. Detroit: Gale, 2016. Retrieved via Biography in Context database, 2016-10-24. "The Haunting of Hill House has become one of the most respected haunted house stories." ^ Missing, Sophie (February 6, 2010). "Review of The Haunting of Hill House by Shirley Jackson". The Guardian. Retrieved December 23, 2017. ^ Jackson, Shirley (1959). The Bad Children: A Musical in One Act for Bad Children. Dramatic Publishing. ISBN 978-1-583-42211-3. ^ Franklin 2016, pp. 338–40. ^ Downey & Jones 2005, p. 217. ^ a b Franklin 2016, pp. 275–80. ^ Franklin 2016, p. 4. ^ Heller, Zoë (October 17, 2016). "The Haunted Mind of Shirley Jackson". The New Yorker. Retrieved February 20, 2017. ^ a b Hattenhauer, Darryl (January 1, 2003). Shirley Jackson's American Gothic. SUNY Pess. p. 195. ISBN 978-0-7914-5607-1. ^ Franklin 2016, p. 458. ^ Franklin 2016, p. 339. ^ Franklin 2016, p. 494. ^ Oppenheimer 1988, p. 269. ^ Franklin 2016, p. 495. ^ Hyman, Stanley Edgar (2014). "Preface" from the first edition, 1968. In: Shirley Jackson, Come Along with Me: Classic Short Stories and an Unfinished Novel. New York: Penguin. ISBN 978-1-101-61605-5. ^ Cressida Leyshon (July 26, 2013). "This Week in Fiction: Shirley Jackson". The New Yorker. Retrieved August 5, 2013. ^ "Shirley Jackson". Encyclopædia Britannica. Retrieved February 5, 2018. ^ "Shirley Jackson's The Lottery". Potrzebie.blogspot.com. Retrieved 2013-09-28. ^ Kates, Joan Giangrasse (January 2, 2012). "James A. Miller 1936–2011: Independent gaffer lit movies for major players". Chicago Tribune. Retrieved February 6, 2018. ^ Taylor, Dan (November 24, 2017). "Legacy of author Shirley Jackson lives on in Sonoma County". ThePress Democrat. Retrieved December 28, 2017. ^ Prudom, Laura (2018-08-27). "Netflix's The Haunting of Hill House Releases Premiere Date and First Look Photos". IGN. Retrieved 2018-10-15. ^ Busch, Anita (2018-07-25). "Shirley Jackson's Classic Story 'The Lottery' Gets First Feature Film Treatment With Kennedy/Marshall At Paramount Pictures". Deadline. Retrieved 2018-10-15. ^ Gardner, Jan (June 27, 2010). "Shelf Life". The Boston Globe. Retrieved October 16, 2010. ^ Miller, Laura. "Is Shirley Jackson a great American writer?". Salon.com. Retrieved October 16, 2010. ^ "The Shirley Jackson Awards". Retrieved 2013-09-28. ^ "Shirley Jackson Day Returns to North Bennington". www.benningtonbanner.com. Retrieved 2016-05-31. ^ Joshi, S. T. (June 30, 2001). "Shirley Jackson: Domestic Horror". The Modern Weird Tale: A Critique of Horror Fiction. McFarland & Co. ISBN 978-0786409860. ^ Haines, Colin (December 31, 2007). Frightened by a Word: Shirley Jackson & Lesbian Gothic (Studia Anglistica Upsaliensia). Uppsala Universitet. ISBN 978-9155468446. ^ Elaine Showalter (September 22, 2016). "Shirley Jackson: A Rather Haunted Life". The Washington Post. Retrieved February 13, 2017. ^ Robin Finn (July 10, 2001). "PUBLIC LIVES; The (Mostly Late) Greats, in New Circulation". The New York Times. Retrieved February 13, 2017. ^ Lanchester, John (June 19, 2008). "Who's Afraid of the Library of America?". London Review of Books. Retrieved February 13, 2017. ^ Jackson, Shirley (May 27, 2010). Oates, Joyce Carol (ed.). Shirley Jackson: Novels and Stories. Library of America. ISBN 978-1598530728. ^ Hyman, Stanley Edgar (1966). "Preface". The Magic of Shirley Jackson. New York: Farrar, Straus and Giroux. p. ix. ISBN 9780374196042. ^ a b Hyman (1966), "Preface", p. viii. ^ "A Marxist/Feminist Reading of Shirley Jackson's The Lottery". New Orleans Review. 12 (1): 27–32. Spring 1985. ^ Lape, Sue Veregge (1992). "The Lottery's" hostage: The life and feminist fiction of Shirley Jackson (Ph.D.). Ohio State University. ^ Appel, Jacob. "Shirley Jackson's Anti-Regionalism". Florida English. 10: 3. ^ Bloom 2009, p. 10. Bloom, Harold (2009). Shirley Jackson. Infobase Publishing. ISBN 978-1-438-11631-0. Franklin, Ruth (2016). Shirley Jackson: A Rather Haunted Life. Liveright. ISBN 978-0-871-40313-1. Kittredge, Mary (1985). "The Other Side of Magic: A Few Remarks About Shirley Jackson". In Schweitzer, Darrell (ed.). Discovering Modern Horror Fiction. Mercer Island, WA: Starmont House. pp. 3–12. Kosenko, Peter. "A Reading of Shirley Jackson's The Lottery. New Orleans Review, vol. 12, no. 1 (Spring 1985), pp. 27–32. Kunitz, Stanley (1973) . Twentieth Century Authors: A Biographical Dictionary of Modern Literature. 1. H. W. Wilson. ISBN 978-0-824-20049-7. Downey, Dara; Jones, Darryl (2005). "Shirley Jackson and Stephen King". Shirley Jackson: Essays on the Literary Legacy: 214–36. Murphy, Bernice M. (2005). ""Do You Know Who I Am? ": Reconsidering Shirley Jackson". Shirley Jackson: Essays on the Literary Legacy: 1–23. Oppenheimer, Judy (1988). Private Demons: The Life of Shirley Jackson. Putnam. ISBN 978-0-449-90405-3.